More than two years ago, the Gürtel case burst–the largest political corruption scandal since Spain became a democracy. The legal proceedings, carried out by three different courts, have given rise to thousands of pages’ worth of indictments that feature a large number of officials from the Partido Popular along with their business relations. And yet, we are now faced with the absurd paradox that the only two individuals who have been tried for the case are Ángel Luna, the Socialist deputy who first denounced it in the autonomous community of Valencia, and the judge who opened the investigation, Baltasar Garzón. The brief that declared the case open for oral hearings, which was made public yesterday, is remarkable not only for the speed with which it was adopted, but because it pre-judges facts about which the court should not pronounce itself until the actual trial. 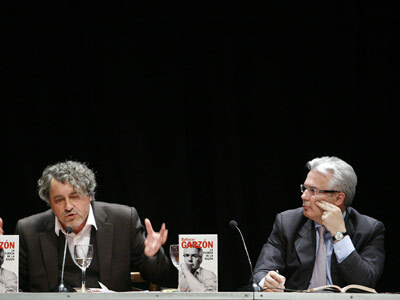 … Many would welcome a destroyed and discredited Garzón before he can be judged for his attempt to investigate the crimes of Francoism. And they would welcome a Gürtel case dismissed on the basis of technicalities. If possible, before the May 22 elections. Hace más de dos años estalló el caso Gürtel, el mayor escándalo de corrupción política en democracia. El procedimiento, repartido en tres tribunales, ha dado lugar a sumarios de miles de folios en los que figuran numerosos cargos del PP y empresarios amigos. Sin embargo, se da la paradoja aberrante de que los dos únicos citados hasta ahora al banquillo por el caso son el diputado socialista que lo denunció en el País Valencià, Ángel Luna, y el juez que inició su instrucción, Baltasar Garzón. El auto de apertura de juicio oral contra este último, conocido ayer, llama la atención no sólo por la celeridad con que se ha adoptado, sino porque prejuzga hechos sobre los que deberá pronunciarse el tribunal en el juicio. … A muchos le viene bien un Garzón destruido y desprestigiado antes de que se le juzgue por su intento de investigar los crímenes del franquismo. Y un caso Gürtel enterrado por defectos de forma, como el caso Naseiro. A ser posible, antes de las elecciones del 22-M.
Garzón has repeatedly stated that he thinks his investigation of the PP corruption case set off the other two charges currently at the Supreme Court, and that he feels the cards are thoroughly stacked against him. More coverage of the case and reactions in El País (Spanish / English) and Público. See also the ALBA editorial on the Garzón cases and other previous Volunteer coverage.